The Black Skimmers are remarkable birds, and our birders were able to see just how remarkable they are. 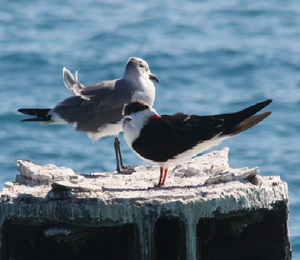 Soon after our guests arrived just off the Dry Tortugas Ferry, they saw a beautiful Black Skimmer sharing one of the pilings with a Brown Noddy. Light, action, camera! Great photos were to be had by all who cared to partake. This week is dedicated to our favorite bird: the remarkable Black Skimmer. This bird is set apart from all the other American birds. Its large black and red bill is as thin as a knife, and the lower mandible is longer than the upper. Interestingly to watch, this Skimmer will drag or skim its lower bill through the water as it flies along hoping to catch a small fish or two with its knife-thin bill. It skims along until it strikes (thus its name); once it strikes a fish, it snaps down so that its upper bill grasps the fish, after which, it drags the fish from the water and swallows it head first. While this Black Skimmer is active throughout the day, it is mostly active in the dusk and dawn, and even occasionally nocturnally. It can only feed in calm waters, such as rivers, inshore waters, or lagoons.The Skimmer rarely dives or swims, instead it is able to use its sense of touch to catch fish in darkness or lightness. The Black Skimmer is a medium-sized to large waterbird and is the only American representative of the Skimmer family. While similar, the other two species are the Indian Skimmer and the African Skimmer, and all use the same unusual feeding method. The Black Skimmer is the only Skimmer found in North and South America. Moreover, this is the only bird with a longer, lower mandible, which makes it appear to have a big head. This guy has a white forehead and underparts and a black crown. Its pointed wings are longer than its short tail. Its legs and webbed feet are a red-orange color. The pupil of its eye has a vertical slit that helps cut down on the glare of the water during the day and aids in foraging at night. This Skimmer nests with other birds on barrier beaches and sand bars. They form colonies which vary in size from several birds to bands of thousands of pairs. The Black Skimmer is a very social bird and enjoys hanging out with other Skimmers during the daytime. They're graceful flyers and often synchronize their movements by turning and circling and twisting together in the air. They oftentimes show aggressive behavior by "barking" like a dog and posturing, which includes tossing of the head, standing upright, and occasionally opening the beak without making any sounds. They clean and preen themselves in fresh water. They sleep with their heads tucked into their wing feathers on their backs. When courting, the male presents a fish to the female as a token of his love. Once she accepts the fish, if so inclined, she holds the fish in her mouth until copulation has occurred and then swallows the fish. Their nest consists of a scrape in the sand. Each partner takes turns scraping the nest. Using both feet, the Skimmer kicks the sand vigorously backwards. No other nesting materials are needed in the nest. The female will lay three to seven eggs directly on the sand. Incubation lasts from 21 to 23 days and is performed by both parents. Once hatched, the parents feed their chicks by regurgitating or by dropping the food on the ground. This is probably because after hatching, the length of their lower beak is the same as the upper one. This changes at close to one month where the lower beak becomes longer than the upper one. Our visiting Black Skimmer certainly did its job of entertaining our birders this week. Stay tuned��more fun is just around the corner with plenty of entertainment to spare!